Actor Yoo Seung Ho opens up an Instagram account! Yoo Seung Ho is on Instagram! On June 5, Yoo Seung Ho surprised fans on Instagram with a brand new account. Under a handsome photo of the actor, the caption stated, "Yoo Seung Ho official Instagram open! This account will be operated by actor Yoo Seung Ho and San Entertainment. Please give great attention and love." Fans are especially more thrilled to see Yoo Seung Ho on Instagram because this is his first time on social media. Also in the past, Yoo Seung Ho revealed he's not a big fan of SNS. You can start following Yoo Seung Ho @yooseungho.san.official. It hasn’t even been a day since the actor opened up his account, but he already has over 30,000 followers. Now, fans will be able to see more of his activities, and he will be able to connect with them on a more personal level as he updates them about his life. The crowd at the event hoping to catch a glimpse of the actor as well as check out the new multi-specialty beauty store. THE grand opening of one-stop beauty store Play Up Advance in Fahrenheit88, Kuala Lumpur, was given a celebrity touch by a South Korean heartthrob, much to everyone’s delight. Yoo Seung Ho, who played the main character in the South Korean romantic drama I’m Not A Robot, made his first live appearance in Malaysia when he officiated at the event. Starstruck fans screamed and cheered as he walked down the red carpet from the entrance to the store, located at the ground floor of the shopping centre. Dressed in a black smart casual outfit, Yoo greeted his fans, charming them with his smile as well as humble and polite demeanour. Joining him to launch the store were Lion-Parkson Foundation chairman Puan Sri Chelsia Cheng and Pavilion KL retail chief executive officer Datuk Joyce Yap. Other VIPs included Lion Group chairman Tan Sri William Cheng, Parkson Retail Asia chief executive officer Michael Remsen, Parkson Branding Sdn Bhd senior general manager Michael Chan, CNKCOS chief executive officer Jung Myung Wan as well as guests from South Korea and Japan. The Play Up Advance store opened in December last year and garnered overwhelming response from men and women alike with over 10,000 affordable beauty products under one roof. The 5,000sq ft multi-specialty beauty store, or “beauty wonderland” as it is dubbed, features over 200 beauty brands from across the world including South Korea, Europe, Japan, Thailand, the US as well as well-known local brands of make-up, skincare, fragrances, nails and hair care products. As part of their prize, fans who won the Play Up Advance contest leading up to the grand opening got to meet and greet Yoo on stage. They also received a Polaroid picture of them together with Yoo, an autographed portrait picture of him as well as a gift. In an interview prior to the store launch, Yoo said he was excited to be in Malaysia and looked forward to meeting his fans. “This was my first time acting in a romantic comedy. I was surprised to learn that I’m Not A Robot drama is so popular and well-received in Malaysia. “I want to thank my fans for their support,” he said, adding that he was currently looking for new projects to work on. Yoo shared that his daily beauty routine involved using a cleanser to wash his face after work, and he makes it a point not to forget his sunblock. He visits the skin clinic whenever necessary. He encouraged his fans who were looking for beauty products not to miss out on Play Up Advance. On the day of the grand opening, Play Up Advance treated customers to a series of hourly bonanza. Play Up Advance is a beauty concept store by Parkson. Handsome actor Yoo Seung Ho made hearts skipped a beat at the grand launch of PLAY UP Advance in Fahrenheit88. Decked in black, with his signature smile, the actor greeted fans at the launch of the store with a short photo and autograph session. Not expecting to be welcomed by many fans, Yoo expressed that he was touched and thanked the fans who had come and supported him. He added that it is a pity that he could not give out his autographs to everyone but we are pretty sure that just seeing him smile is a gift to everyone who came. While signing autographs for fans, the MC of the day went around passing the microphone to fans who wanted to give a message to the actor. One fan managed to make Yoo laugh out loud when she mimicked the famous line by Wanna One’s Park Ji Hoon – Nae maeum seoge jeojang~ (I’ll Save You in My Heart~). PLAY UP Advance is a one-stop beauty wonderland, which first opened its doors to consumers in December 2017. The store features over 200 beauty brands ranging from Europe, South Korea, Japan, Thailand, USA, local brands from Malaysia and many more, with over 10,000 affordable beauty products from brands such as VelyVely, 16brand, VT Cosmetics, IPKN, Mille, Beauty Buffet, Flormar, Models Own and more. Malaysia’s homegrown brands such as Breena, Fame, Glam X, Marcella & Co., MYJ, Nita, Oh Most Wanted, Orkid Cosmetics and SO.LEK are also available giving more variety for customers. Actor Yoo Seung Ho gives a try to interact with his fans by launching his own social media account and gains incessant attention from the public. On June 5, his management agency San Entertainment has announced that the official social media account of Yoo Seung Ho is available. Previously, Yoo Seung Ho has never interacted with his fans online although it has been 18 years since he made debut as a child actor. Because his fans could see him only through films, dramas, or some TV shows on screen, Yoo Seung Ho's social media account is relentlessly getting attention. With the photo of Yoo Seung Ho in chic black outfits, he made a post, saying, "Please keep your eyes on the account! ", and humbly asked his fans to follow his account. With the photos of him that show his bright smiles at the event, Yoo Seung Ho's fans cannot take their eyes off from his posts. His fans expect that from the account, they can constantly see Yoo Seung Ho's daily lives and behind stage. 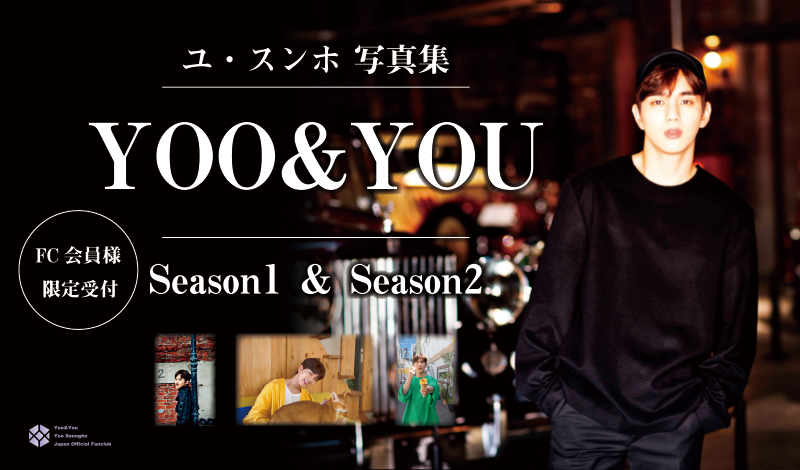 The release of Yoo Seung Ho's photo album, YOO & YOU season 1 & season 2, marks the first official activity of Yoo Seung Ho for his japanese fanclub. The photo album is supposed to be released as a memorial photo collection. It is exclusively for the members of the Japan official fanclub. Thank you Beiru for all the news about Yoo Seung Ho. I wish more fans visit this thread so we can have a nice conversation here. I recently became a huge fan of YSH after watching IANR. After that, I began rooting for his past dramas. Is there any news of him doing another one? Thanks, Beiru, for posting all these news about Yoo Seung Ho. I wish more fans visit this thread so we can have a nice conversation. I'm from California. At his Malaysia FM he said he is still looking for and reviewing scripts. Anyway, YSH is known as a hard-working guy and he does at least a drama per year. He doesn't take long breaks in between projects. I'm so happy you've became his fan, he is an amazing actor and talented beyond his age. It is very rare to find a talented guy as him around his age. Most of the time, actors become good and their acting reach new heights when they reach the 30s. 2018 KOREAN DRAMAS HAVE BEEN SIZZLING WITH HEART FLUTTERS AND WELL-MADE STORIES FROM A MIXTURE OF FRESH AND OLD FAVORITE DRAMA MALE LEADS WHO HAVE CONQUERED THE K-DRAMALAND IN THE FIRST HALF OF 2018. We are not talking about just one actor starring in the dramas. The production companies appear to be following the trend of joining two or more reliable and popular actors to spearhead and spice up the last six months of 2018 drama narratives. If we ponder on it closely, most of the stories produced for television from the tail-end of 2017 up to now were hero-centric. It’s interesting to note that we also have variety of characters which is the exact opposite of how we mostly met prosecutors and serial killers in the previous year. Yoo Seung Ho, Kim Rae Won, Hwayugi deities, and the jailbird brothers of Prison Playbook spurred the masculine vibe this year. Then it continuously flowed with engaging spring dramas which flaunted Return, Eulachacha Waikiki, The Grand Prince, Switch Change The World and Suits. It is about the upcoming japanese photobook. I agree with you, hopefully he will choose his next drama wisely. It is long overdue for him to get a breakthrough performance, since his return from military he has been plagued with bad luck with starring in dramas full of plot holes and inconsistencies, especially his last two ones. He deserves to get a good role and a good drama. Of all set purchasers, applicants in Japan and overseas applicants, by lottery, Twenty persons will be given The Special Card which have Yoo Seung Ho autograph. ※We do not notice the Winner list. ※The person who get the Special card, we will ship the card with<ＹＯＯ＆ＹＯＵ～season1>. Shipping Fee： It differ to country to country. We will inform you of the fee after receiving your order. ※As two Photo Books are set each Sale Time, we are to ship them Two times as mentioned above. ※The Sale times are expected date and by some conditions the date could be changed to some extent. When you apply for the purchasing, please put the tittle as 「YOO SEUNG HO Photo book」 and inform your name, telephone number, address and the set(s) you want to buy on main Text blank. You need to transfer the money to our Japanese bank account. We are sorry but you have to pay overseas remit charges including the Photo book price. After receiving your order, we will send the payment guidance in a week. You need to pay accordingly. Overseas transfer usually need two or three days, so, you have to wait one week or so until you get the confirmation mail regarding your payment. A Set of The Photo Book costs 9,720 yen. For overseas remittance, customers need to pay overseas remit charges in addition to the Photo book price. The charges usually go to 4000 yen or more. ※If you have friends or acquaintance in Japan, you can ask them to pay on behalf of you. It save overseas remit charges. We have to remind you that some banks, such as invest bank use their affiliate banks and impose extra charge. Be aware that once a customer pay for the photo book we will not refund the money. If you accept the conditions mentioned above please tell us the photobook(s) and the number(s) you want to buy. Then we will let you know the guidance for the payment. If you have any questions or concerns, tell us regardless of what they are.